THEY FEARED YOU, BROTHER BIKO! You said: "We do not want to be reminded that it is we, the indigenous people, who are poor and exploited in the land of our birth. These are concepts ,which the Black Consciousness approach, wishes to eradicate from the black man's mind before our society is driven to chaos by irresponsible people from Coca-cola and hamburger cultural backgrounds." They feared you, hence they killed you. The new ideas you were working out jangled their nerves, and you became a problem without a solution, just like we all were. But they couldn't get the whole black nation to slip on a bar of soap. No, that was reserved for top problems like you. Why didn't they just send you to <?xml:namespace prefix = st1 ns = "urn:schemas-microsoft-com:office:smarttags" />Robben Island, like the other top problems of the day? Perhaps you could have had your own political party, perhaps you could have become President of your land one day. Or Vice President. Or foreign minister. Youth minister would have suited you as well. I remember one day thinking how things would have been, had you been around to blog. Biko's Blog. Biko's big, bad, black blog. A big, black-green-red weblog emblazoned against our consciousness. Whose nerves would that have jangled then? I wonder what brand of soap they conjured up in their imagination as they declared your death. Sunlight? Lifebuoy? Palmolive? What does it matter? I wonder who made the decision to seal your lips with blows, what in your thinking pushed them over the edge, how many of the top brass watched the fatal beating. What they said to their spouses when they got home ("My God, I killed a man today," or, "Hi honey — killed another kaffir today."). They needed your consciousness movement, Steve, in order for them to have a consciousness of their own. By the way, they released Nelson Mandela and other prisoners a while ago. He became the first President of a free South Africa and then stepped down to let a younger Thabo Mbeki take the resins. You remember Thabo, don't you? Well, you'll probably know his dad, Govan Mbeki, on on the island prison. Man, so much things to say. South Africa is a real nation now, with tons of problems like any other real nation. There are unemployment, joblessness and urban violence. But nobody is being beaten to death and announced accidentally dead in detention, or having committed suicide. After you died, some looked away, as they had done for the very longest time. Most of them now have their guns trained on the ANC government. Paradoxal, huh? But others asked questions: " How did Biko receive the injury that caused his death? Who inflicted it, under what circumstances? Why was he kept naked and chained? Why did the doctors who attended him fail to interpret the undisputed signs of brain injury?" "Why did the doctors and all the police who were with him from the time he was injured until he died, all fail to notice the wound on his forehead which is so clearly visible in photos taken after his death?" "And even more: why was the brain-damaged and dying man finally sent off on the long, terrible drive to Pretoria from Port Elizabeth, a big city with adequate hospitals? " "Why did the police give conflicting evidence, often caught out in contradictory statements or outright lies, none of which could explain the head injury? They had the time and the ability to concoct a story that would, at least superficially, account for the wound on Biko's head." "Why did they not do so? Why was an inquest held, why were details of the way he was treated permitted to be broadcast to the world. Why did the inquest find that no one was responsible for his death?" No answers. There are never any answers to such things. Unfortunately for us, you were right when you told us that: " These guys - the day they get me - they'll kill me, because I'll beat up the guy or make him beat me so that I just die. If my hands are tied, I will spit in his face. I'm not going to answer questions that I don't want to answer." Bantu Stephen Biko was born on 18 December ,1946, in Ginsberg, a suburb of King William's Town, South Africa. 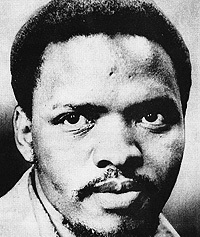 In 1968, Biko established a new all-black organisation, the South African Students Organisation (SASO) and became its first president. SASO adopted a radical doctrine tagged "Black Consciousness", which by Biko's definition was the "cultural and political revival of an oppressed people." SASO quickly became popular among young black South Africans and was later banned under the apartheid government's Terrorism Act. Its leaders were persecuted and in 1977, Biko was arrested and taken to Pretoria where he was killed under mysterious circumstances.